It’s bizarre, but it’s probably not the end of the world. It’s weird, nonetheless. 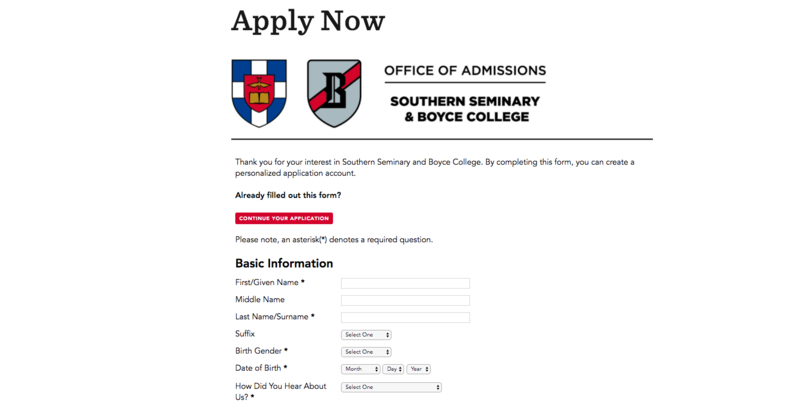 Southern Seminary, which has the reputation of being a stalwart proponent of the inerrancy of Scripture and a bastion of Calvinism, has a peculiar feature on their online admissions application form. It asks “birth gender.” One would think that the clarification of birth gender would be unnecessary (as though there were any other kind). Likewise, Dr. Mohler and other leading faculty members signed the Nashville Declaration, which (although it stops short of calling homosexual desire sin), does call transgenderism and homosexual behavior sinful. Certainly, this oddity shouldn’t be taken as a sign that Southern Baptist Theological Seminary will soon be admitting transgender students (even though Southwestern Seminary has enrolled Muslims, so stranger things have happened). Most likely – if anything – the extra caveat of “birth” in front of “gender” is designed to keep people from self-identifying in any such way that they want. Nonetheless, it’s a startling remembrance stone of our cultural drift that a semi-conservative seminary has to specify that when it asks about gender, it means that which was assigned at birth by God, and not that which the admissions applicant feels.